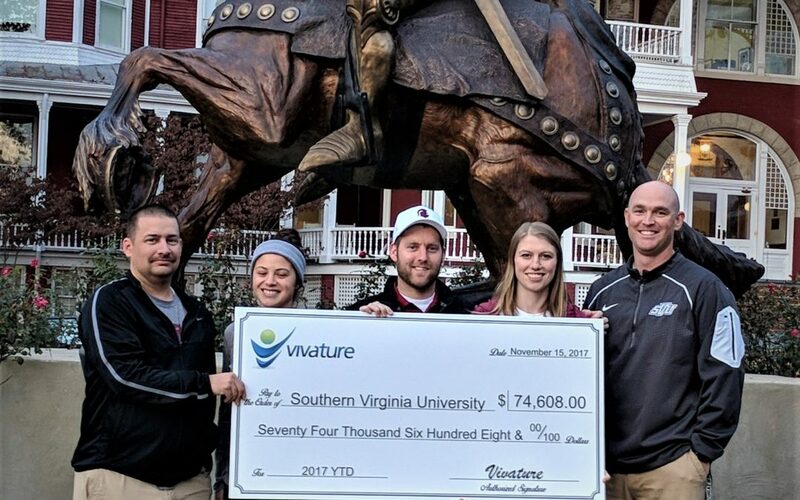 Dallas, Texas – Last week, Vivature, a Top 25 emerging Sports Technology Firm in sports, presented Southern Virginia University with a check of $74,608. Vivature, based in Dallas, TX, has over 400 collegiate partners (220+ actively billing). Using a 20 million-dollar enterprise-level single database, Vivature’s clients like Southern Virginia University, use their NExTT 360 software to record student-athlete injuries and treatments being conducted, as well as record and track their activities in Nutrition, Counseling, Academic Counseling and Strength & Conditioning. Southern Virginia University, located in Buena Vista, Virginia, is home to the proud Knights. Southern Virginia began its athletic program in the fall of 1997, one year after it became a four-year liberal arts college with an LDS environment. In 1998, the Knights joined the United States Collegiate Athletic Association. The 2012–13 school year was SVU’s first as a provisional NCAA Division III member; it joined the Capital Athletic Conference in July 2013, and became eligible for conference championships in 2014–15. After four successful provisional years, the Knights became a full NCAA Division III member on September 1st, 2016. On October 16th, 2017 Southern Virginia University announced its football program would switch over to the Old Dominion Athletic Conference in 2019. They boast of over 420 Student Athletes that compete in 22 sports. “Vivature is proud to have a client like SVU who has worked hard to stay in compliance and utilize our NExTT Software to streamline their Athletic Training room documentation. Their dedication is proven, with the presentation of this check which was revenue generated year-to-date. We look forward to continuing this positive partnership.” Responded Vivature’s CEO, Muzzy Bass. For media inquiries or more information please contact: Lance Wilson, Executive Vice President at lwwilson@vivature.com, or call 1-972-687-1877.